Disclaimer, No i'm not actually hacking here its a term used for modding stuff. My xbox rrod By the way. I harvested also, and atari 5200 for the components that would allow better heat dispersion, i also modded my hard-drive to upgrade it to 1 TB of information, Because i really hate limitations. On top of ALL of that I had two HD-DVD Player units, But decided i should take 1 of them and convert it to a blueray disc player which is my next project on the loop. You lost me at "replacing it with the processers of sevral other gaming consoles"
Also, the only hardware mods worth doing to an xbox 360 are jtag, cygnos v2, x clamp, increased fan speed, and xbox 360 laptop. Maybe he wants to come up with a new mod? Hacks and Mods arn't, in my opinion, an interesting subject. Wert - If they're being rude, edit their posts. Pie - If Wert gets in another fight over Pikmin - break it up. See you guys on another thread! Wert Ac wrote: You lost me at "replacing it with the processers of sevral other gaming consoles"
I have seen people do simaler things actually. It is not impossible. You can actually make a improvised touch screen for a ds with several other parts. Deadlyends2 wrote: Good for you. I'm suprised at you, Owning a mod site and you dont believe me. You are a fake. I had respect for you but you shoot it down ACTING like you Know something, When really you dont. i HAVE made a 360 processer and you are just mad cause you CANT. Instead of attacking me, Why dont you make a thread about how you lied about modding? How DARE you call me a fake! I KNOW how to deal with people who are lying. I've been friends with SligStorm for quite a while, and your BS is even worse than his. At least he was sometimes believable. All you've done is describe something impossible without showing any evidence. Hell, if you somehow prove me wrong, I'd gladly apologize, but somehow I don't see that happening. Good day to you, SIR! Ok I have removed all off topic, or insensitive and "stubborn" posts except silvers message to the mods. please try and let this get back to its original topic please. he already read it, so it was pointless. I guess, but I wish that you'd trust that I know what I'm talking about when it comes to modding (unless I state that I'm unsure...it happens). God, I wont attack wert anymore. I'm just not going to respond to ANYTHING he posts anymore, I swear he has it out for me. 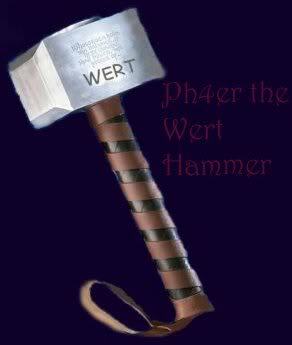 Wert, Heres the deal, You leave me alone, I leave you alone. I dont like having conflicts with ANYONE unless they Deserve it. As far as i can tell, You dont. I apologise for Insulting you and pikmin. But i'm pretty sure you just hate me for Posting my opinion on a website, If thats the real case and not just my imagination, Then W.e, i could care less. 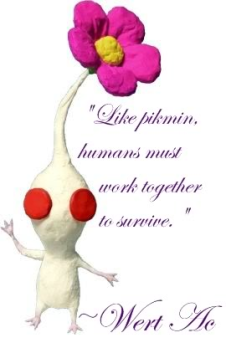 If it isint true, then i will Try to like pikmin more. The main thing is, This war ends here, and now. I don't hate you, I hate your opinion...And your claim on this topic....I don't truly dislike someone until the third strike. You only have two. if your not trying to make enemies and you are an enemy of our enemy, then you are our friend. "its NEVER a good thing to lie! Bad things happen! And if hes allowed to lie, people will believe him, and those who don't will think its okay to lie too!" this is what wert said and he is right, without proof... you can be called a lier, and to insult someone who may have higher knowledge then you by saying they are a fake is not a good way to make friends... on that note I want you and wert to appologise to each other and to get along please. :I i have allready apologised. Also, Why would i give proof if the first thing i'm told is "Thats not possible"? Like, This is gonna seem like a HUGE attack on sajextryus, But has he proved he's a hacker? He has never given proof, Yet you all believe him. If sajextryus hacks me, I'll give proof. well people are like that, without proof we presume the worse, anyway as it seems this thread is now without proof and has become pointless, im locking it. DiabolicalBug wrote: :I i have allready apologised. Also, Why would i give proof if the first thing i'm told is "Thats not possible"? Like, This is gonna seem like a HUGE attack on sajextryus, But has he proved he's a hacker? He has never given proof, Yet you all believe him. If sajextryus hacks me, I'll give proof. edit: Sorry, I didn't notice this was locked =/ .